Juan Carlos Romero is one of the most accomplished and experienced coaches in the optimist class. Juan has been coaching for nearly 25 years between his home country of Ecuador and the United States. 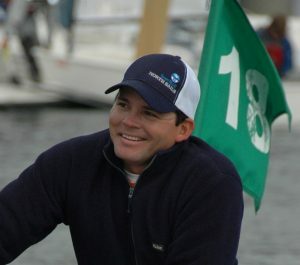 He has coached at many premier programs such as the Annapolis Yacht Club, St. Petersburg Yacht Club, Lauderdale Yacht Club, Coral Reef Yacht Club and is currently the Sailing Director at the Key Biscayne Yacht Club in Florida. His skillfulness has led to coaching for both the Ecuadorian and United States National Teams in large IODA events such as South Americans, North Americans and Worlds. Juan is also an important part of the North Sails One Design Team and is active in the development and testing of new optimist sails. Juan Carlos was able to answer some of our questions for this Airwaves article. I started sailing when I was 13 years old. Where did you start sailing? At my home club, Salinas Yacht Club in Salinas, Ecuador. What kind of boats did you sail in your youth? I sailed Optis, Europe Dinghies, Lightnings, Sunfish, and Lasers. As soon as I started sailing I felt in love with the sport and since then I have been sharing my passion for the sport with others. Where/who did you coach first? I started coaching in the Chongon dam just 20 minutes from Guayaquil City at a new sailing school sponsored by Filanbanco bank and the support of the Ecuadorian Yachting Federation back in 1994. Tell me about sailing and working in your home country of Ecuador. I didn’t have enough time in the Optimist since I had a late start into the world of sailing but was very fortunate to qualify to represent my country at the 1990 IODA South American Championship. From there I jumped into other classes and kept sailing actively until my cousin introduced me to the coaching and right away decided that I wanted to devote my life to coach sailing. I helped grow the Optimist Class in the country, built programs in different regions, worked at different yacht clubs and taught how to sail to some of the best sailors Ecuador have. Tell me about your time as the national coach for Ecuador. 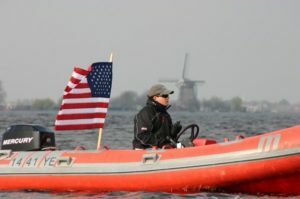 Later on, I became one of the Optimist National Team Coaches and soon I started traveling with the team to international regattas such as IODA Worlds, South Americans, and other international events. How did you get here coaching in the states? In started in 2001 when I applied for a summer coaching job at MSA (Manchester Sailing Association in Manchester-by-the-Sea, MA). Martin Stephan, former America’s Cup sailor and MSA Program Director at that time hired me. After that first summer coaching US sailors at this great Jr Sailing Program, I decided to come back to MSA for a 2nd summer and kept coming every summer to coach at different yacht clubs until the Annapolis Yacht Club offered me a year-round coaching position in 2005. Which I accepted and since that fall season I have live and coach here in the US. What clubs/programs have you worked at here in the US? I have worked at the Manchester Sailing Association, Eastern Point Yacht Club, St. Petersburg Yacht Club, Fishing Bay Yacht Club, Annapolis Yacht Club, Miles River Yacht Club, Lauderdale Yacht Club, Coral Reef Yacht Club, Seawanhaka Corinthian Yacht Club, and the Key Biscayne Yacht Club. 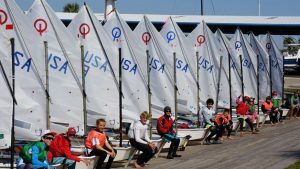 How many international regattas have you coached for the US? What drives you to keep coaching for all these years? 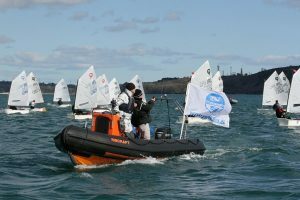 The passion for the sport and the opportunity to impact in a positive way many youth sailors’ lives through the coaching. Can you name a few of your favorite drills for coaching optimists? The ‘Never Ending Drill’, ‘Speed Up/Slow Down’, ‘Section Starts’. In your experience, what separates a good sailor from a great sailor? In my opinion, what separates a good sailor from a great one is not just a test of skill, but a measure of will. That is, startup success only comes to those willing to put in the time, do the work and sacrifice self for sustained effort. In other words, an intense desire to win, improve and never quit. What are some of the biggest challenges you have faced in coaching? Getting the paperwork done when renewing my US working visa (every 1-2 years)…hahaha.